Read on to see where the free wine and cheese are gonna be. 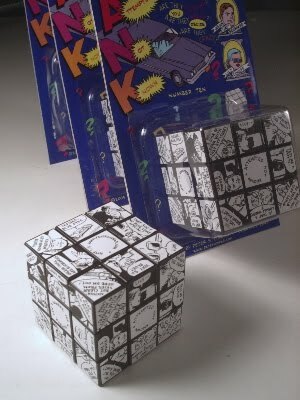 The Comics Cube is a cube puzzle with the colored stickers removed and replaced with comics. I had been thinking about the idea of comics that could be rearranged or constructed by the reader. Scott McCoud has done a lot of online exploration of this area, and Jason Shiga has created multi-threaded narrative forms in several of his works, but I was looking for a simple way to literally put the narrative into the reader's hands. A Rubik's Cube of comics panels was obvious. Each face contains eight panels arranged radially around the center. The corner panels are diagonal. 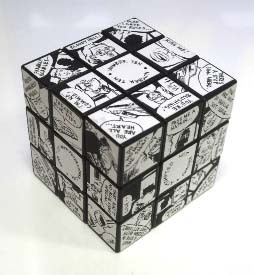 Each panel has an implied color; something in the text or the drawing refers to one of the colors on the cube. This means that it is possible to solve the cube again, after you have spent some time mixing it up and creating new stories. Like the Cigarette Comic, the second comic/object presented a number of production challenges. First, I had to find a source for cubes in bulk. Of course, the Internet came to the rescue; but the cubes were clearly quite old, and the glue had hardened to the point where the stickers could not be peeled off. After experimenting with various solvents and sharp implements, I finally settled on a method that involved heating the cubes in a toaster oven and then using a craft knife with the blade installed backwards to scrape the stickers off. It turned out that the melting point of the glue was not much lower than the melting point for the cubes themselves, which led to a few melted cubes as I developed the technique. From December 18 through March 13, you can see more of Peter Conrad's work at the Cartoon Art Museum. Come to the free reception on Thursday, February 10th!